The Copperdollar team will be performing all around the UK at the end of the month. Sugar skulls and the Skaletones Mariachi band, live DJ and the ghosts of Basingstoke’s past will come together for one night only on the 27th of October. In the square in the old part of the town, Copperdollar will be bringing a festival atmosphere and would love to see you there. So, If you’re near by, come and join the Copperdollar Skelly Girls and dance in the pale moonlight. 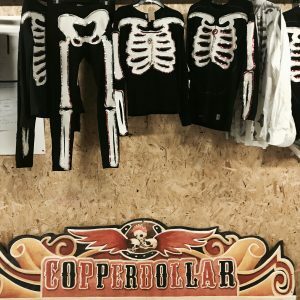 You’ll also be able to find the Copperdollar team at Horniman Halloween Festival in London for a parade from 12.30 to 2.30 on the 28th and 29th of this month. If you have little ones who love to dress up then bring them along to play games with the skeletons in the gardens. And finally, if you’re in Belfast then you’re invited to the Belfast Halloween Monster Mash and Fireworks Display on the 29th of October from 4pm to 7pm at The Slipways, Titanic Belfast. The theme is Day of the Dead so little ghouls and scary skeletons of all ages can come along in their creepy carnival outfits or monstrous magical ones. Look out for Maria De La Muerte and her Skelly crew! Copperdollar is an immersive theatre company, created in 2008 by artistic director Kt Simpson. Copperdollar’s award winning performances combine visual art and theatre, both indoors and out. 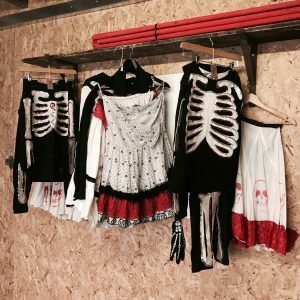 Inspired thematically by Samhian and Mexican Day of the Dead, the company’s shows celebrate life, whilst exploring the concept of the afterlife.